Chapter Headings Problem Classification Introduction to the Solving Methods. 1. Elements of Problem Solving Theory: Application of Cutting Strategies. 2. Solving Discrete Optimization Problems on The Basis of &PSgr;-Transformed Method. 3. Weak Methods and Heuristic Reasoning. 4. Logic-Based Problem-Solvers: Approaches and New Methods. 5. Programming Concepts in Problem Solving. 6. Future Concepts: Some Philosophical Issues. References. Glossary. Index. Problem solving is the very area of articifical intelligence AI which, probably, will never result in a complete set of formalized theories, in a pragmatic philosphy, or in a "universal" applied discipline. Studying questions concerning this area, encompasses different concepts, models and theories. This volume of the series looks at classifying problems, interpreting them, and the methods of solving them. 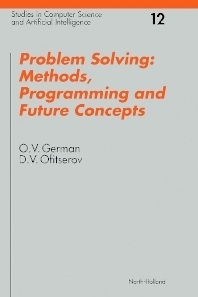 The final chapter covers future concepts such as universal problem solving approach restoration, weak methods becoming strong, the role of formal logic in future developments, human factors and other paradigms. Different groups of readers such as mathematicians, specialists in computer sciences, and programmers will find this title of interest. Post-graduates and the students specializing in AI and applied mathematics will also find the work useful.